Hatton Garden is the focus of an area rich in history. It is more than 400 years since one of Queen Elizabeth I’s favourite courtiers, Sir Christopher Hatton, built a mansion on land that had been the garden of a great medieval palace. 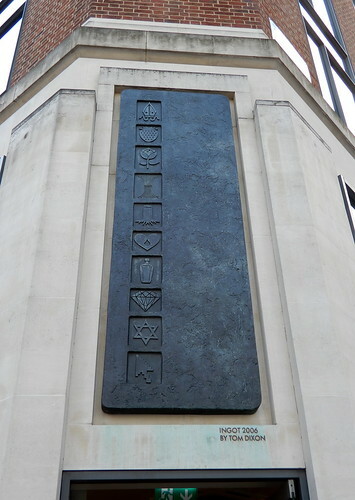 All the local streets have stories to tell, this bronze Ingot by Tom Dixon was placed on the newly refurbished Johnson Building, to help to narrate some of these through a piece of public art. 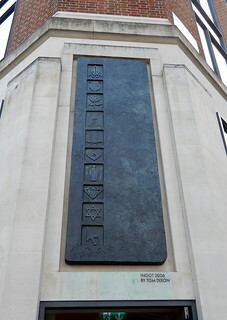 This lump of metal takes its inspiration from the gold trade and also shows the creation of a new hallmark for the building. The Ingot features a series of symbols, each representing a certain historic aspect of the local area.